ODESSA--The combined Watkins Glen/Odessa-Montour football team lost to Newark Valley 61-0, Friday, Sept. 23. 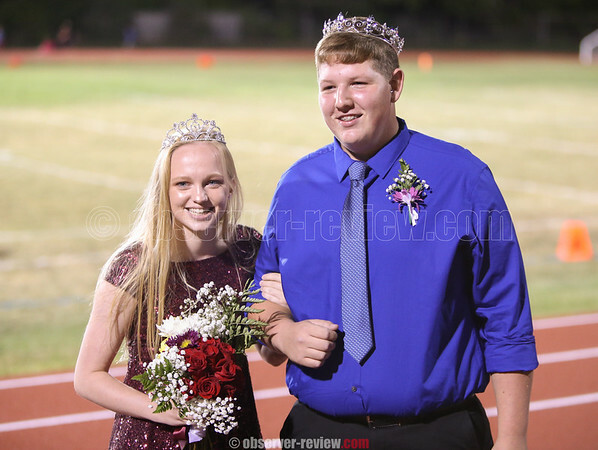 The night was Odessa's homecoming and during halftime, Kyle Frasier was named king, while Sage Garrison was selected as homecoming queen. Kyle Frasier, Andy Fudala, Collin Povoski, Nick Sgrecci and Andy Stevenson were the homecoming king candidates. The queen candidates included: Paxtyn Brown, Alyssa Crout, Sage Garrison, Dasia Herrmann and Taylor Sykes. The Seneca Indians trailed early, failing to stop the Cardinals on their opening drive and giving up a 20-0 deficit at the end of the first quarter. While Austin Dalrymple got an interception in the second quarter, Newark Valley extended their lead to 40-0 by halftime. The third quarter ended with a score of 54-0. The Seneca Indians marched the ball down to the Newark Valley goal line in the fourth quarter, but fell a yard short of the goal line on fourth down. Three plays later, Newark Valley had another long rush for the game's final score, winning 61-0. "We got to keep everybody focused," Head Coach Trevor Holland said. "Our young guys, the sophomores, they are stepping up when we don't have a lot of depth. [...] We are going to keep them focused, positive and healthy, and everything will take care of itself." The Seneca Indians fall to 0-4 on the season going into next week's away game against Oneonta Saturday, Oct. 1.